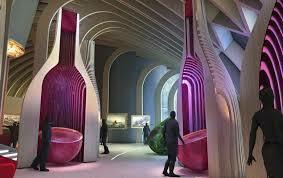 Have you heard of the Guggenheim museum of Wine ? Wine Tourism is getting bigger and bigger. It is quite normal for France to make sure its voice is heard in this industry… in the most elegant way! On June 1st, the Cité du Vin (The City of Wine) will open its doors, in the presence of French President Francois Hollande, to inspire travelers in their exploration of the Bordeaux’s terroir wealth. A stylish building that reflects to the most famous wine river ! The building is facing the river and is entirely covered of glass and aluminum golden slabs so it will nicely reflect on the Garonne River. Looking at these, a surprising resemblance can be noticed with the Fondation Louis Vuitton that just opened in the capital city. Parisian architects’ team from XTU was chosen to give the building the curved shapes, the fluidity and the elegance of a great Bordeaux wine. But one can also see these curves as the representation of the wine’s swilling movement when falling into a glass. It will be up to you to decide! 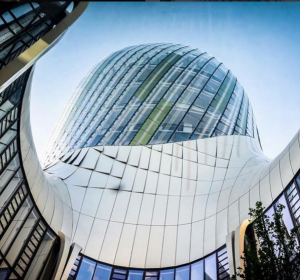 What cannot be denied is the spirit of wine that is beingevocated by the futuristic and magnificent structure. And the success is already there! Not opened yet but already awarded ! Travel + Leisure magazine has awarded the Cité du Vin as the most beautiful museum of the year among thirteen other contestants. The Cité du Vin aims at positioning itself as the place that brings together tradition and modernity in one glamorous style, perfectly enhancing the image of its host, the city of Bordeaux. 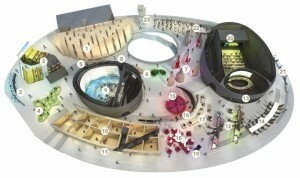 In addition of serving knowledge about wine cultures and traditions to its visitors, the Cité du Vin will be used as a tourism-platform for the explorers of the region. In fact, a dedicated space for wine tourism will be settled inside the museum to encourage people to discover and enjoy activities across the surrounding vineyards Saint-Emilion, Médoc, L’Entre-Deux-Mers, Graves, Pomerol and all the wine making zones of Gironde area. 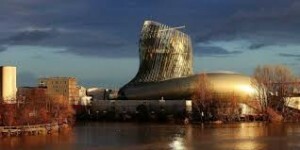 The story of French wine will be told inside the Cité du Vin, but not only! The Cité du Vin offers a deep understanding of the civilizations that played a great role in wine’s epic saga that started 3000 years back! From the remote and dry areas of Mesopotamia, to the mysterious wine grapes of chili, via the wineries of the Australia’s Gold Coast… The first exhibition, starting on the 13th of July, will thus be dedicated to Georgia, considered as the “cradle of wine viticulture”. More than twenty innovative multimedia and digital installations will be displayed to offer you a refreshing look on the development of wine culture and the art of good life that went along. Along these exhibitions, program will include cultural activities linked to wine will also be shown to the audience. You will thus be able to participate to concerts, dancing representations, debates, workshops and even… watch football games during the European Competition that happens in June. 400 000 to 500 000 visitors are expected for the first year of this new “Guggenheim of wine”, a prestigious nickname that American newspapers already adopted. And last but not least, restaurants and bars will also be on site, so you will be able to test what you have learned, right after the visit! More than 14 000 bottles will be stored in the cellars of the building, including 200 french wines and 600 different wines from various countries. A not to be missed museum for wine amateurs and wine experts ! Another reason to visit Bordeaux and its wine regions.